Harvey Alvy served as a practicing principal for 14 years, gaining both elementary and secondary administrative experience. His teaching career began as an inner-city elementary school teacher in New York City. Alvy later taught in middle and high schools in the United States and abroad. His experience in multicultural international schools is extensive and includes the American School in Kinshasa, Zaire; the American International School in Israel; the American Embassy School in New Delhi, India; and Singapore American School. Alvy is a founding member of the Principals' Training Center for International Schools and was an NAESP National Distinguished Principal. He held the William C. Shreeve Endowed Professorship in Educational Administration at Eastern Washington University (EWU), where he now serves as a Professor Emeritus. In 2004, he received the EWU CenturyTel Faculty Achievement Award for Teaching Excellence. Alvy earned a doctorate in Educational Administration from the University of Montana focusing on the problems of new principals. He conducts workshops, both nationally and internationally, on the newcomer to the principalship, instructional leadership, ethical leadership, characteristics of great teachers, shaping collaborative school cultures, educational trends related to supervision, and the leadership of Abraham Lincoln. 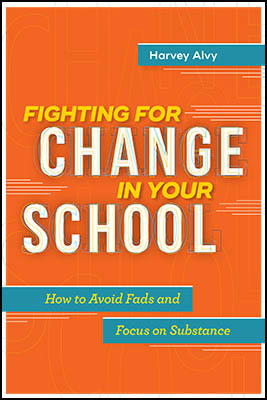 Harvey Alvy offers a thoughtful roadmap and guidance to help K–12 leaders select, implement, and assess school- or districtwide initiatives that actually work.